The Hubble Space Telescope is seen from space shuttle Atlantis just before astronauts grabbed it on May 13, 2009 during the STS-125 mission. With Hubble's new facelift almost complete, and the successful launch of the Herschel and Planck observatories last week, a golden age of astronomy is truly under way, scientists say. "I don't think there's any question about that. We have the largest set of assets in space for astronomers ever," said Jon Morse, NASA's Astrophysics Division Director. "It really is a golden era to be a practicing astronomer. It entices me to leave my desk job and go back to the field." There are now more than a dozen major observatories in space eyeballing everything from the sun to planets around other stars to radiation from the dawn of time. NASA's Hubble Space Telescope is getting its fifth and final makeover. New instruments and repairs will give the 19-year-old veteran a new lease on life. Meanwhile, the Herschel and Planck observatories were launched into space last week by the European Space Agency. These telescopes will expand on astronomers' abilities to detect objects in the infrared and microwave parts of the spectrum, respectively. 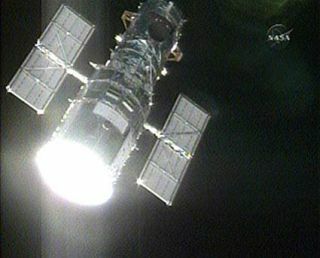 "We're, I think, going through a peak in our capabilities on orbit with refurbishing Hubble, the number of other missions we have, and then with the launch of Herschel/Planck," Morse told SPACE.com. And it's not just the sheer amount of technology in space. It's also the coverage the telescopes give astronomers. All radiation -- from low-energy, long-wavelength radio waves to visible light to high-energy, short-wavelength X-rays and gamma rays -- is part of the electromagnetic spectrum. Different objects are best studied in different wavelengths, and some of that radiation doesn't penetrate Earth's atmosphere and so can only be studied from space. "We cover essentially the entire electromagnetic spectrum now, all the way from the gamma rays out to the microwaves and everything in between," Morse said. This capability allows astronomers to look at particular regions of the universe in multiple wavelengths of light. With different telescopes looking at different parts of the spectrum, they can work together to provide a clearer pictures of particular regions of space, for example, clusters of galaxies. "You see very different things" this way, said Chandra X-ray Observatory's Press Scientist Peter Edmonds. Chandra has teamed up with both Hubble and the Spitzer Space telescope to do this kind of work. You "get a much better picture" of the universe this way, Edmonds said. Space also offers clearer viewing not obstructed by Earth's atmosphere, so that even with modest lenses and mirrors, space telescopes can spot pockets of faraway star birth, or the formation stages of galaxies and mergers of black holes from the farthest reaches of the cosmos. The impact of all these missions on astronomy has already been a great one, Morse said. "Without question, it has revolutionized our understanding of astrophysics," he said. But with enigmas such as dark matter and dark energy and questions like whether there are other Earth-like worlds remaining to be solved, the host of space telescopes ? old and new ? promise many great discoveries to come from the new golden age. It's an exciting time to be an astronomer, both Edmonds and Morse said. Starting out as an astronomer in this current era of space observatories can be compared to starting out in the field of manned space travel in 1960s, Edmonds said. "I believe that the future of astrophysics is bright and that our best days are yet to come," Morse said. "I have to say 'our best nights'," he added, as any good astronomer would.